Corn, or maize as it’s known in many parts of the world, is a large grain plant domesticated by indigenous peoples in Mesoamerica in prehistoric times. It constitutes more than 80% of the grain fed to animals in North America and, when fed correctly, it is a good-quality and nutritious grain for horses. 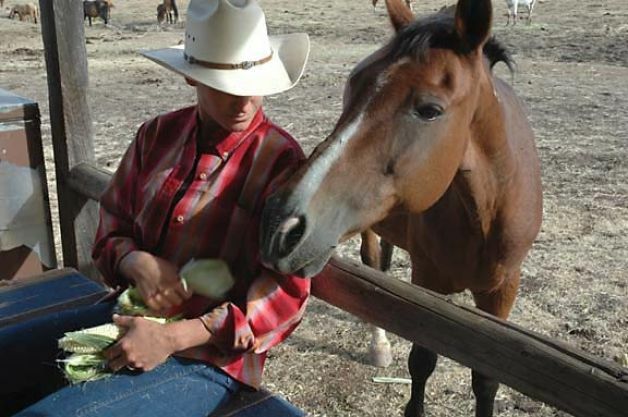 Corn is grown in almost all states in America and is readily available to horse owners. The leafy stalk produces ears which contain the grain, which are seeds called kernels. Because Corn is a hull-less grain, however, it is very high in starches. Corn grain is a major feed grain and a standard component of livestock diets where it is used as a source of energy. Some of the by-products of Corn processing for flour (hominy feed, bran, germs, oil meal), starch (Corn gluten feed, Corn gluten meal) and alcohol/biofuel industries (distillers’ dried grains and solubles) can be fed to horses. Corn quality is judged by the moisture content and percentage of well-formed kernels. When checking for quality the presence of damaged kernels should be accounted for. Corn is a cereal just like oats and barley and to horses it is usually fed flaked which improve its digestibility. The hardness of the individual kernels means that in order to be digested well by the horse, Corn usually needs to be processed, by cracking (breaking each kernel into pieces), or flaking (flattening individual kernels with a roller). Processing increases the utilization of the grain in the horse, but also exposes it to the growth of molds which contain mycotoxins. Of all the cereal grains fed to horses, Corn is the most likely to be contaminated by molds, but more about this later. 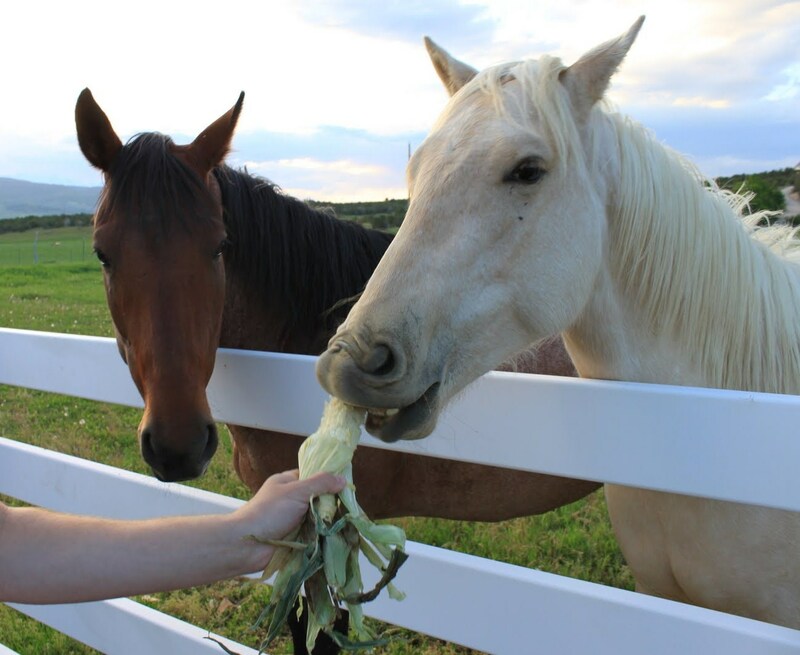 On the cob – Whole-ear Corn can be fed to horses because the cob is high in fiber and low in energy. This form can be used as a management tool for horses that bolt (eat too fast) their grain. Shelled whole Corn – This is unprocessed and, because some whole-Corn kernels will pass through the digestive tract without being digested, it is advisable to process the kernels in some way to increase digestion. For this reason whole Corn is not typically used in textured horse feeds unless it is processed (flaked , cracked, etc.). Cracked Corn – This is a medium sized particle and when the kernel of Corn is cracked it allows digestive juices to enter the Corn and increase digestibility. Steamed Rolled Corn – It is moistened and flattened. Steam rolling further processes the Corn kernel, creating more surface area for digestive juices and increasing digestibility. Steam Flaked- Corn is heated, moistened and pressured to flakes. Ground or crushed Corn – This type of processing makes the Corn kernel too fine to be fed to horses. It could pass through the small intestines too rapidly, which can lead to fermentation in the hind gut. This may lead to colic in the horse. 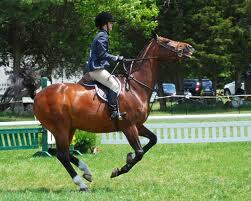 Finely ground Corn should also not be used in textured horse feed because of the increase risk of colic. Corn grain is very palatable and it is the most valuable energy source among cereal grains. 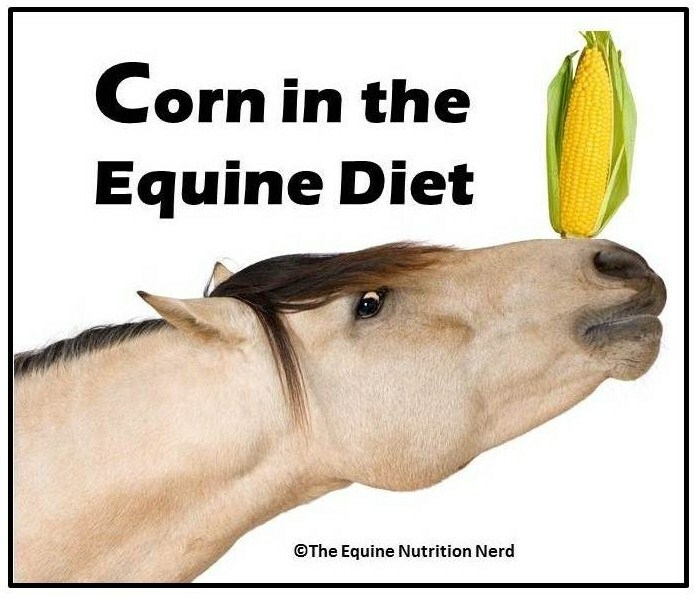 Corn has a variety of value in the equine diet but the primary reason it is added to feed is an energy source. It is one of the most energy-dense feeds; with a digestible energy value that is more than twice that of oats at a whopping 1.54 Mcal of digestible energy (DE) per pound. Corn has high energy content per unit of weight and a high weight per unit volume. 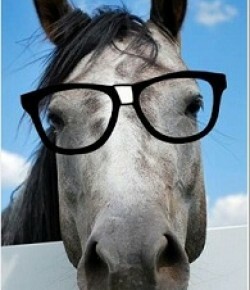 Therefore, feeding a volume of Corn thus provides a horse two to three times more energy than that same volume of oats. So attention to weight is necessary when feeding Corn. Cereal grains without a hull, such as Corn and barley, are more concentrated energy sources than oats, which do have a hull but this also makes them less fibrous. Corn is made up of 71% starch (a carbohydrate), 4% fats, 8% protein, and has basically no fermentable fiber at 2.2% (unless fed with the cob). The protein in Corn grain is generally deficient in the amino acids lysine and tryptophan so amino acid supplementation is often necessary. Corn grain is low in calcium and 75% of the phosphorus is bound in phytate which makes it not readily available to the horse and also reduces calcium availability. While low in protein and many of the essential amino acids, Corn is the only grain with high carotene content and carotene is converted to Vitamin A in the small intestine. This makes Corn a good source of vitamin A which is needed for eyesight, growth and formation of tissue. Whole Corn has basically the same RATIO of omega 6s to omega 3s as Corn oil which has an omega-6 to omega-3 ratio of 49:1, it just contains less of them since it is not pure fat but the whole seed. Therefore, Corn must be fed with good quality forage to help offset this inverted ratio. Corn and sugar have the same gylcemic index of 100, therefore a cup of Corn will have the same effect on the body as a cup of sugar which is why it can lead to excitability. At 71%, Corn contains a lot of starch (carbohydrate). Because it is rapidly broken down into glucose and used for energy many horse owners that feed Corn are not bothered by this high level. The starch (carbohydrates) in Corn is lower in digestibility in the horse’s small intestine than the starch in other feed stuff, so there is more risk of undigested Corn starch passing through the foregut into the hindgut. Processing the grain to open up the seedcoat (cracking, flaking, or rolling it) helps make the starch more available to the horse so will reduce this risk somewhat. 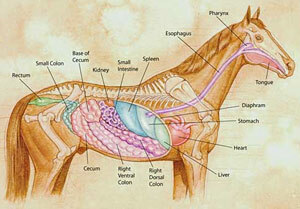 Corn starch is broken down primarily in the horse’s small intestine by an enzyme called amylase. This process efficiently produces glucose, a type of simple sugar essential for fueling some bodily functions. 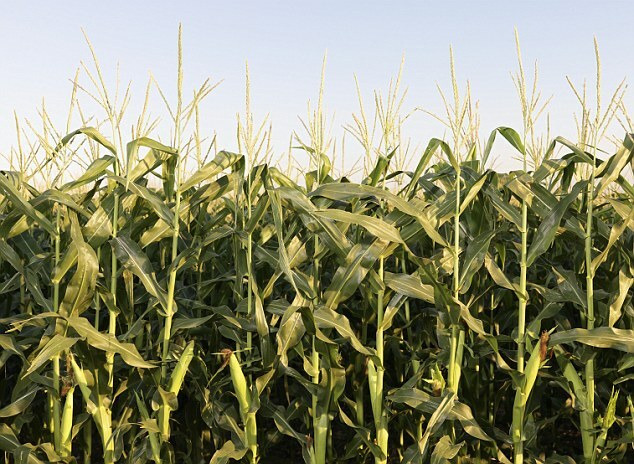 Because of its high energy density and the readily available form of carbohydrates, Corn has gotten the reputation as a “heating” feed. This is due to horses acting “hot” or hyper after eating a diet with Corn. Another view of Corn as a “heating feed” is that it will help keep a horse warm in the winter. Because the greatest amount of internal heat in the horse’s body is generated through the microbial fermentation of fiber, not starches, an increase in dietary fiber such as hay will get you to this goal quicker. Horse that need an energy source that packs more power for its punch would be good candidates for Corn in their ration. These would include high performance horses and hard keepers. For most horses Corn is just too energy dense. Corn is still very good ingredient in a horse feed and when used properly can provide valuable sources of energy. Just be sure that any grain (or concentrate) fed to meet the daily requirements that achieve an overall balanced diet for each individual horse. Most of the energy contained in grains, such Corn is in the form of starch so horses with certain metabolic conditions such as insulin resistance or obesity should never have Corn included in their diets. Because Corn provides lots of energy per pound, and energy needs increase during cold weather, many horse owners feel Corn is a good winter feed for a horse. Corn oil is a highly concentrated form of calories so many feed companies add it to their commercial mixes to bump up the fat content. Some horse owners top dress their feed to get the “bloom” to their horse’s coat that high fat oil can produce. What are the Risks and Concerns? Care should be taken when feeding Corn, as with most cereal grains its best not to feed large quantities at any one time. Starchy feeds like Corn are digested in the small intestine but if a horse eats too much of them at a time, some of it may enter the large intestine undigested. This will upset the balance of good bacteria in the large intestine which is supposed to digest fiber. If converted by the microflora in the cecum to volatile fatty acids and lactic acid it will lead to digestive upsets such as diarrhea, colic and laminitis. When I see a horse with Corn in its diet that is acting hyper more often than not it’s due to an owner who substituted straight Corn for an equal quantity (volume) of another grain in their horse’s diets. They unwittingly supplied more than twice the energy to their horse in the same amount! You’ve heard it from me before, feeding by weight, rather than by volume, is crucial when feeding your horse. 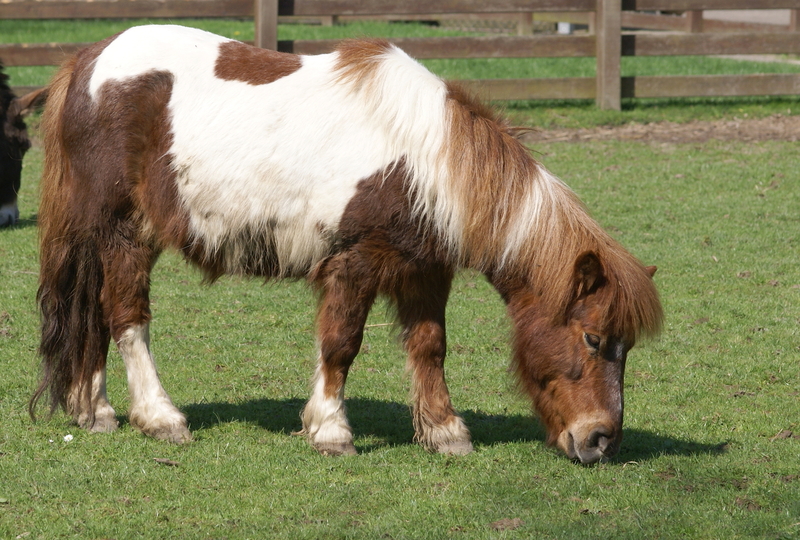 Older horses have a harder time with digestion many times due to dentation issues such as poor or missing teeth. 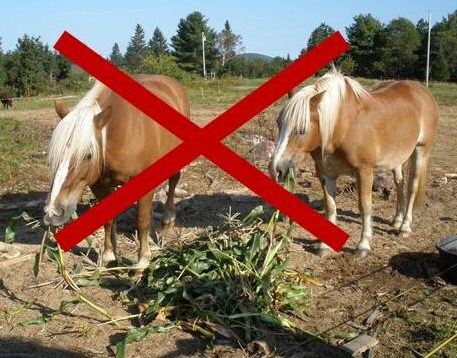 Older horses (or any horse with bad teeth) will have difficulty eating whole Corn. In addition struggling to chew feed properly can compromise the rest of the digestion process, often resulting in weight loss. The older horse needs an easy-to-chew and highly digestible source of nutrients to maintain its health and condition. 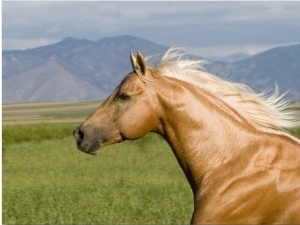 Many owners see the Corn in their horse’s manure due to its inability to chew it thoroughly. 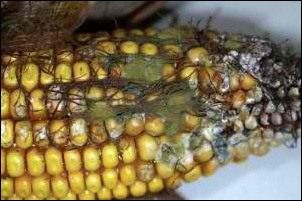 Corn is susceptible to various molds that can produce mycotoxins which have serious effects on horse health. This danger is more prevalent in states with warm, humid climates during the Corn growing season. The mycotoxin fumonisin can infect the Corn kernel and unfortunately, horses will readily eat contaminated Corn since the fumonisin toxin doesn’t decrease the Corn’s palatability. Fumonisin causes a neurological condition called equine leukoencephalomalacia (ELEM), also known as moldy Corn disease. ELEM causes the degradation of the white matter of the horse’s brain, resulting in blindness, coordination problems, and death. While fumonisin can be detected in the field, it tends to be localized in stalks within the field and thus can be overlooked in field checks. Mycotoxins are produced during the growth of the plant and are dependent on handling or storage after harvesting. But as horse owners, we know that any kind of grain may become moldy if not stored properly or for too long, even hay can become infected with botulism if it becomes moldy. 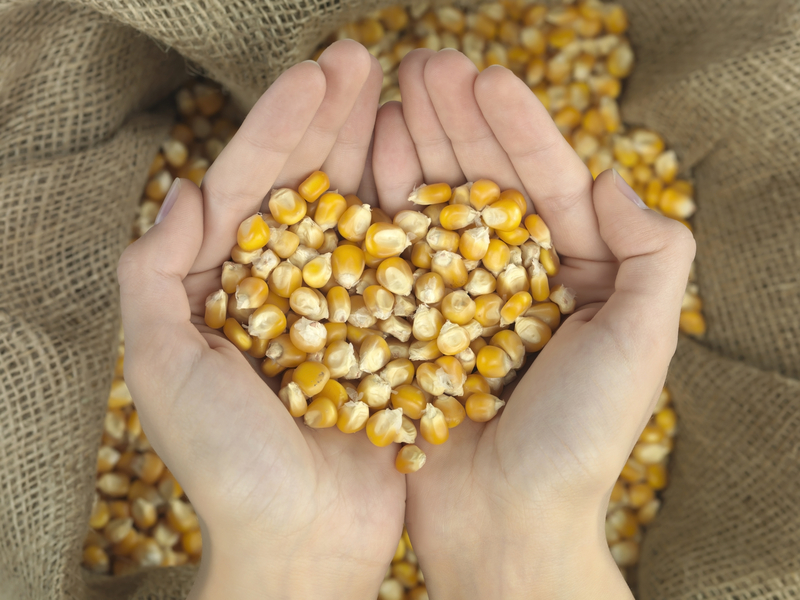 To protect your animals, you will want to purchase your Corn from a supplier that regularly tests their grains. Reputable grain dealers and commercial feed companies check to make sure that the Corn used in your horse’s diet has been tested for fumonisin contamination. 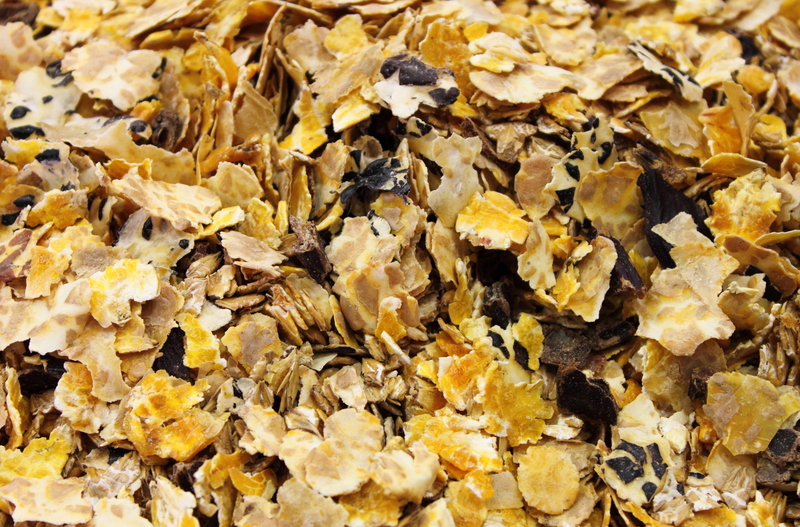 Check to see if the mill that manufactures your feed is HACCP certified. HACCP stands for Hazard Analysis Critical Control Point and is designed to prevent, reduce or eliminate potential biological, chemical and physical food safety hazards. If you are concerned at all about Genetically Modified Organisms (GMOs) then you might want to know that 86% of all U.S. Corn products are Monsanto GMO and are carcinogenic. Next to soy, Corn is one of the most prevalent genetically modified foods in the US food supply. Finally, there is concern that as the market for biofuel sources increases, Corn prices will limit the availability of Corn for livestock diets and drive up the price of all feeds used for livestock production. Horses that are obese, insulin-resistant, or prone to laminitis should not be fed Corn or any feed containing Corn. Draft horses often fall into those categories unless they are in heavy work. While it has received a bit of a bad rap in recent years due to its higher starch content, it can be, and is, still a valuable piece of the formulation of a total feed, as long as the proper attention is given to the overall starch level of the finished feed. Corn fed to horses is usually cracked, steam flaked or rolled and mostly it is added to a mix. Straight Corn is generally a safe grain for most horses if fed by weight NOT VOLUME in a balanced diet with a forage foundation. 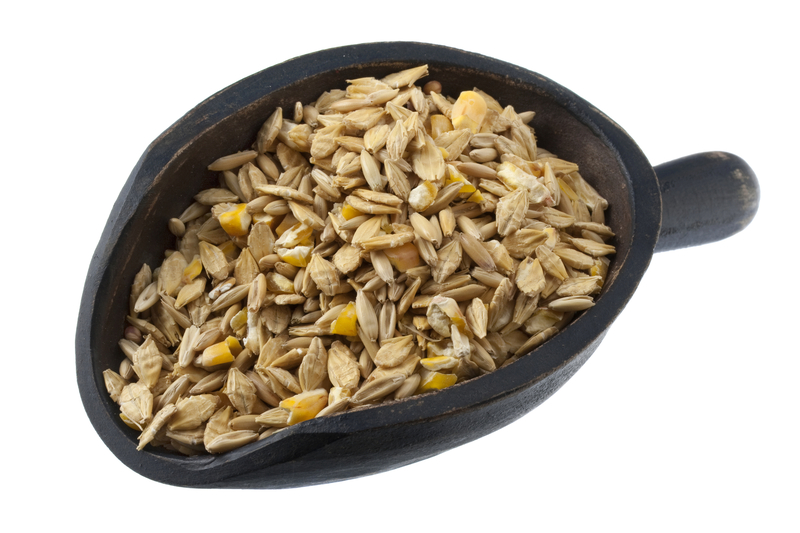 Corn is easily overfed if substituted volume-for-volume for oats or other grain mixes. Personally, I would not recommend Corn being fed as the sole grain due to its high starch content. To me, it is better mixed with other grains to balance its high starch concentration, but even then, it should not be more than 20% of the mixture. One way to reduce the amount of starch fermented in the large intestine is by feeding processed grains. Processing the Corn such as cracking, rolling, and flaking, increases starch’s digestibility in the small intestine. This process disrupts the carbohydrate’s structure making it more accessible to enzymes in digestion. Most commercial feeds that include Corn have tested it for mycotoxins during the processing therefore, if you want the benefits of Corn in your horses’ diet, I would feed a commercial concentrate. There are multiple reasons that vegetable oils are added to a horse’s diet. One very palatable fat source is Corn oil, researchers at Virginia Polytechnic and State University tested 15 oil types on horses for taste and Corn oil came in on top! Corn oil can be added to your horse’s grain to bump up the fat content for extra calories for work or weight gain. It is a concentrated source of energy, is very digestible, provides essential fatty acids and Vitamin E, and is a rich source of polyunsaturated fatty acids. Corn oil processing begins with corn germ, which is the embryo of a Corn plant, distinct from the starchy nutrients in the endosperm. 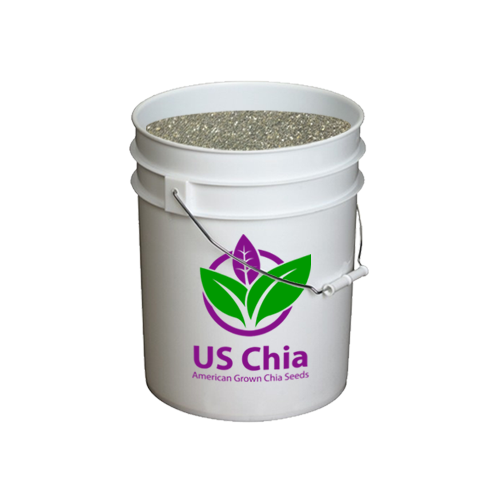 The oil content of the germ is about 85 percent of the total oil in the seed. The first step in Corn oil processing is mechanical and some processors use as many as 40 steps to complete their Corn oil products. One bushel of Corn yields 1.55 pounds of Corn oil (2.8% by weight). Commercial feed companies add oil to formulated feeds and this is represented as part of the minimum amount of crude fat on the feed tag. Crude fat is primarily from the oil in the grain and if the value is above 3-3.5% fat then you know oil has been added. For example, a feed tag reads 7% crude fat it will generally contain about 3-4% added oil. The best way to determine energy in a feed though is by calculating the total digestible energy (DE) of the feed. DE includes energy from fat as well as from NDF (neutral detergent fiber), NFC (non-fiber carbohydrates) and protein. 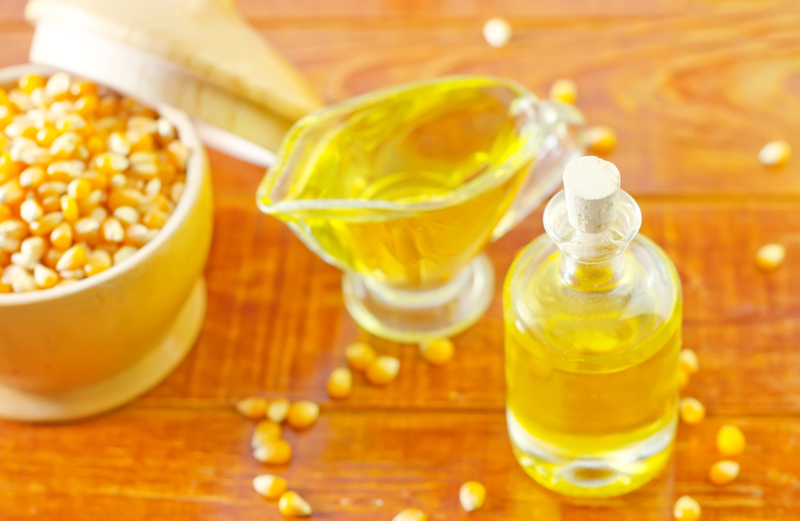 A cup of Corn oil will weigh about 8 ounces (1/2 a pound) and contains about 2,045 Kcal (calories). For comparison, a pound of feed generally provides about 1,320 Kcal, so adding oil provides a lot of alories in a half the amount! A 1000 lb horse at light work requires about 20,000 Kcal per day, so that cup of Corn oil would provide about 10% of the required DE per day. When you add Corn oil to your horse’s diet, you are providing more fat and energy without the starch related increase in excitability. It also adds more calories without adding more grain which is always good. Corn oil is easy to digest once your horse gets used to it, and reduces dust that can irritate your horse, particularly if they have respiratory problems. It is also great for coats and hooves. My main concern with feeding Corn oil is the Omega-6 to Omega-3 ratio. If your horse primarily eats a hay and grain diet then it likely getting an imbalance of Omega-6 compared to Omega-3 already. It might be better to add oil other than Corn, one with a higher in Omega-3, like fish oil, flaxseed oil or hempseed oil, which can offset this imbalance. However, if the horse’s diet is without added grain and is full of fresh forage such as pasture grass, which is high in Omega-3s, adding Corn oil should be fine. 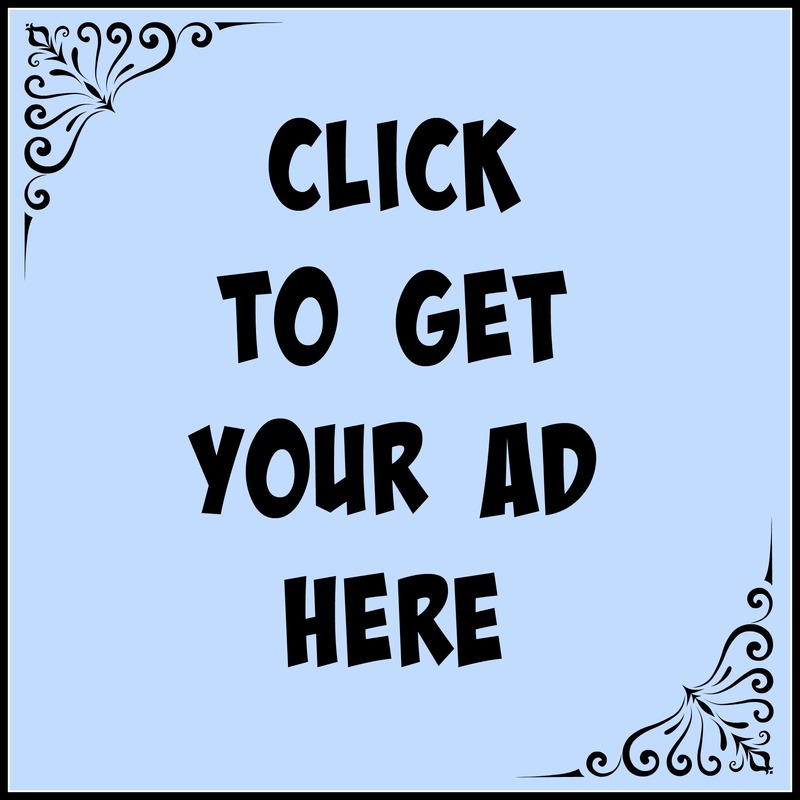 Corn oil can be purchased in bulk and you should begin by adding only one to two ounces of Corn oil per meal to see if your horse will eat his feed with the added oil. If so, over a 7 to 10 day period you can work up to 11⁄2 to 2 cups per day in total. Well, that about sums it up for Corn and Corn oil. Hope you found some useful information! interesting info on horses and diet…grasses and grains are truly NOT a horses best friend and perhaps we should be looking into a much more varied and fibrous diet for their physical and mental health.